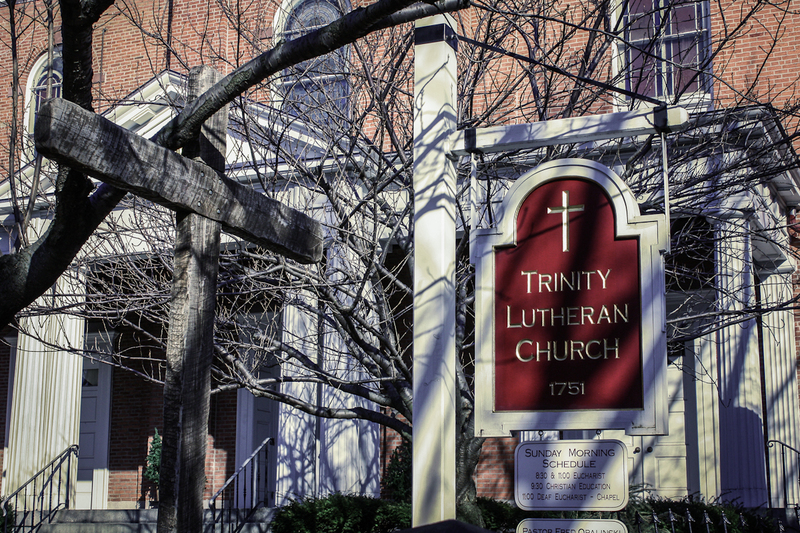 The city of Reading and Trinity Lutheran Church have grown side by side through 260 years of their history. 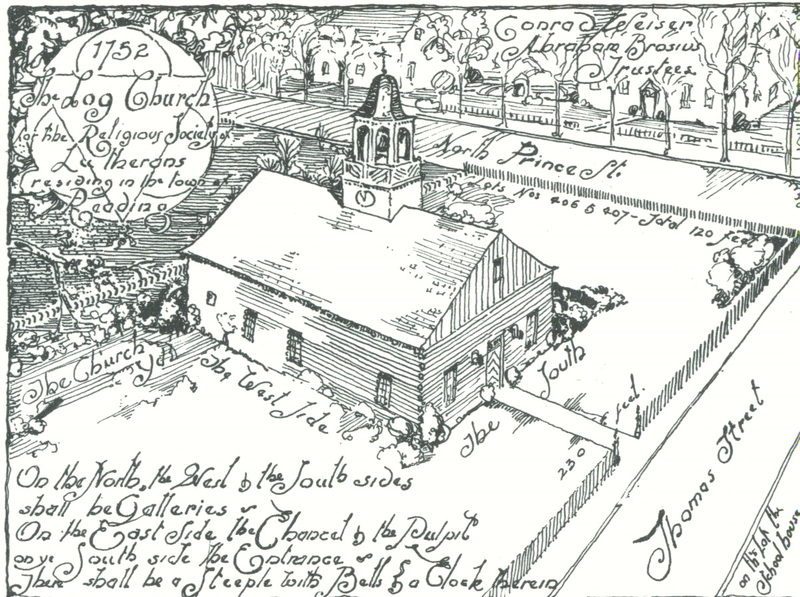 When the Towne of Reading was laid out in 1748, the Rev. Tobias Wagner, pastor of the large Tulpehocken congregation and officiant at the marriage of Henry Melchior Muhlenberg to Ann Marie Weiser, began getting Lutherans together for services at Conrad Weiser’s Trading Post. By 1751 Trinity was formally organized. A land grant was received from the sons of William Penn for lots at the corner of Prince and Thomas Streets (now Washington and Sixth Streets! ), and in 1752 log church was built, surmounted by a modest bell tower and clock. The congregation petitioned for admittance into the Ministerium of Pennsylvania, and Dr. H.M. Muhlenberg, its president, officiated and preached the first sermon here on October 15, 1752. At least ten pastors served in that log church. 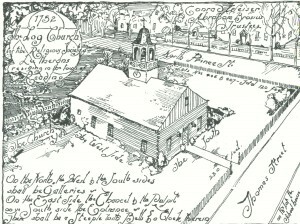 In the relatively prosperous times following the American Revolution, an elegant brick two-storey church was erected and dedicated on Trinity Sunday, 1794. There was a bell tower but no steeple. In 1833, the first steeple was complete; reaching to 202 feet, and reported to be the tallest structure in Pennsylvania at the time. After sixty years it was deemed unsafe and completely rebuilt. It survived a lightning strike in 1925 only to be felled by a tornado in 1933. In 1963 the steeple was again re-built (on a steel frame! ), replicating the original design. With the addition of spotlights, it remains a city landmark both day and night. Passersby are intrigued by the old grave markers in the Churchyard, the original cemetery. Here lies Dr. Bodo Otto, a senior surgeon in George Washington’s army, who, with his sons, used Trinity as a hospital after the Battle of Brandywine in 1777. Over the years, Trinity became known as ‘mother church,’ giving birth to a number of Lutheran congregations in Reading. St. Matthew’s and St. James’ were started as English speaking congregations, while St. John’s broke away in 1860 to continue holding services in German. St. Luke’s, Grace, Faith, Hope, Peace, St. Mark’s, and Holy Spirit in the city, and Bethany in West Reading, are all descendents of Trinity. Belying its age, Trinity has been involved in a number of innovative and creative ministries over the years. For nearly a century we have served our Trinity Deaf congregation. Trinity helped to establish the city-wide food pantry system and provided leadership to found Opportunity House, a homeless shelter, child care and learning center. For nearly four decades we have broadcast worship and special programming via cable TV, more recently sharing the gospel via our video website. In the last few years we have been particularly devoted to strengthening education in the city, ‘adopting’ 10th & Penn Elementary School and partnering with the Reading/Berks Literacy Council to provide ESL, GED and literacy support. The Rev. Dr. Gunnar Knudsen, historian and Trinity Pastor from 1943-1967, wrote in his congregational history, “Two Living Centuries”: “We are the possessors of a living foundation on which to build the coming years. We must pray in thanksgiving for the heritage that is ours, but only in the sense that we can continue to the point where the final phase of the Creation story can be pronounced as a benediction on our work, “and God saw, and it was good.” Celebrating the 260th anniversary, Trinity has published an updated history, written by member Brian Trupp. Filled with wonderful photographs and stories, it is a testimony to the Spirit’s continuing work among and through us. If you would like to purchase a copy please email our Parish Administrator, Donna Taglieri, using our contact form below, or call the church office at 610-374-4861 during normal business hours.